Nearly everyone will be nauseous or vomit every once in a while because of an infection, motion sickness, acidity, or another reason. If you notice nausea all the time or it is bad enough to prevent you from participating in daily activities, you will need to take it seriously. 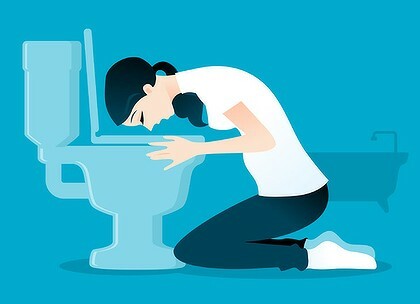 Morning nausea is frequently linked to pregnancy, but it is possible to have morning sickness not pregnant, either if you know you aren’t pregnant or are male. If you are experiencing nausea in the morning and don’t know why, here are some possible causes and solutions for your problem. The term morning sickness is typically used to describe a queasy stomach whether or not you feel that you will vomit. Everyone is nauseous at some point and it is one of the most frequent complaints in medicine. Nausea is considered to be a symptom of multiple disorders, which means there are numerous causes for morning sickness not pregnant feelings. Luckily, they typically aren’t serious so you shouldn’t be alarmed. Viral gastroenteritis or the stomach flu is a type of intestinal infection with abdominal cramps, diarrhea, vomiting, nausea, and/or fever. Most people will recover without any complications except for the very young or the elderly. Acid reflux is when partially-digested food or stomach acid travels back up the esophagus or food pipe. If you think you have indigestion or acid reflux, talk to your doctor about medications that can help relieve acid-related symptoms. If the pancreas or gall bladder is inflamed, this can also lead to nausea. Pancreatitis will be accompanied by pain of the upper abdomen while gall stones come with pain of the upper right abdomen that may be constant and last several days. Migraines are painful headaches that come with a pulsing or intense throbbing in a certain part of the head. They also typically include vomiting, extreme light and sound sensitivity, and nausea. Anxiety and depression, as well as stress can lead to abnormal body functioning and intestinal or stomach issues like vomiting, nausea, diarrhea, constipation, bloating, or irritable bowel syndrome. This is also sometimes due to the adrenaline that is released within the body that leads to imbalances of the digestive system. Labyrinthitis is also referred to as vestibular neuritis, vestibular neuronitis, and otitis interna. This inner ear problem leads to vertigo as well as possible ringing of the ears or hearing loss. It may occur once, in a series of different attacks, or as a persistent condition diminishing over three or six weeks. It is also linked to vomiting and nausea and possible eye nystagmus. Certain pain medications, including hydrocodone, morphine, oxycodone, and codeine may lead to vomiting or nausea. You may also notice irritation of the stomach or slowing of your intestines and bloating due to over-the-counter medications like non-steroidal anti-inflammatory medicines, aspirin, or products with potassium or iron. Although less common, low blood sugar may also lead to morning sickness not pregnant. Fasting overnight can cause your blood sugar to drop since your body doesn’t receive energy. This can lead to a feeling of queasiness or light-headedness when waking up. The ideal solution is to simply have a snack in the morning when you wake up or even eat closer to bedtime. If you are intolerant or allergic to a certain food, you may experience vomiting and nausea. It may also be due to a change in your diet. Food poisoning is another possible cause and this happens when your food is infected with bacteria. Other symptoms include vomiting, nausea, diarrhea, abdominal pain, and fever. After drinking too much alcohol, you may get a hangover which leads to nausea and a headache. Overeating leads to nausea since the digestive system can’t properly process the food. This is common among those with weak digestive systems and those who have undergone surgery to reduce their digestive system’s functional capacity. Luckily, there are several things you can do at home to treat your nausea without the help of a doctor. Try drinking chamomile tea, ginger ale, or other beverages that will help settle your stomach. Avoid tea, coffee, soda, and other caffeinated beverages. Avoid dehydration by drinking clear liquids, especially if you are vomiting. Eat small and frequent meals so your stomach can gradually digest food. Choose bland, simple foods that are easier for the stomach to digest, like bananas, chicken soup, rice, unbuttered bread, and crackers. Certain OTC medications can also provide relief. Consider liquid or chewable antacids, medications with bismuth sub-salicylate (like Pepto-Bismol), or solutions with phosphoric acid, fructose, and glucose (like Emetrol). They will coat your stomach lining while neutralizing stomach acid. You can also try Dramamine (deimenhydrinate) or Bonine (meclizine hydrochloride), which will prevent or treat motion sickness by blocking brain receptors which trigger vomiting. If the nausea persists, your doctor may prescribe a medicine to help with it. Most of these medications can lead to drowsiness. You should never take a prescription or OTC drug without talking to your doctor if you are pregnant.